Q1. Is MSc in Data science/Data Analytics same as ML/AI as some universities don’t have AI but Data Science? Q2. I am interested in MS Data Science and not MS Analytics as the later is not technical in nature. Are MS Data Science and MS Data Analytics the same? Q3. How to Choose Between a Master’s in Data Analytics vs Business Analytics? Q4. Which are the best universities for Master in Mahcine Learning and Aritificial Intelligence? There are many blog posts around top MS Data Science programs. But, I am unable to figure out the top MS Machine Learning / MS Artificial Intelligence programs. These are some of the queries that I received from many folks who reached out to me for guidance in 2018 and/or opted for the 1:1 counseling sessions. Obviously, due to capacity and other factors, many candidates didn’t get the opportunity for the personalized sessions. So, through this article, I intend to reach out to a wider audience. Data Science, Machine Learning (ML), Artificial Intelligence (AI), and Analytics are extremely inter-related. More often than not, candidates struggle to choose the right program at the Masters (MS) level. In this post, we will discuss some of the basic differences among themselves. 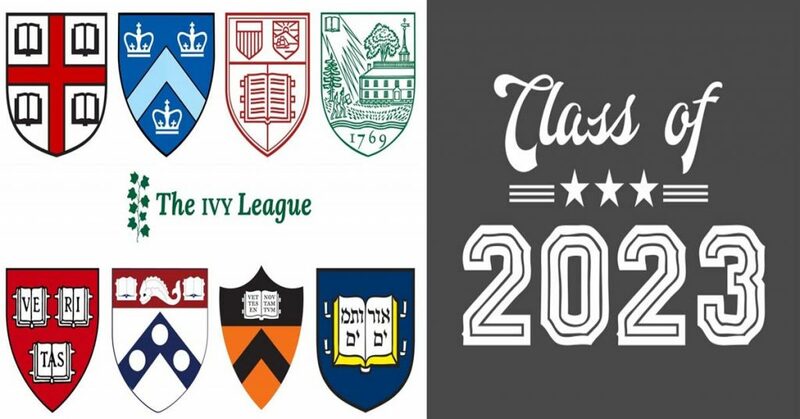 Additionally, we will also discuss how to choose the right program and top universities for Masters in Machine Learning and Artificial Intelligence. In today’s data-driven world, data science, machine learning (ML), artificial intelligence (AI), and big data analytics are the new buzzwords. India is becoming a hot market for digital technologies. But, core AI job roles related to deep learning, machine learning, and NLP, are areas where talent supply is lower than market demand in India. In a recent report by business analytics firm Great Learning, India has more than 50,000 jobs in both data science and machine learning lying vacant. India lacks massively when it comes to talent in data science, machine learning and artificial intelligence. Currently, the banking and financial services sector is the biggest market for analytics and data science professionals, having created 44% of these jobs last year. E-commerce came in a distant second, creating 12% of data analytics jobs last year. Healthcare (12%), energy & utilities (8%), telecom (6%), media (6%) all contributed to creating data science jobs as well. According to Belong’s research, less than 2% of professionals who call themselves data scientists or data engineers have a Ph.D. in AI-related technologies and just 4% AI professionals in India have worked on areas such as deep learning and neural networks. Kaggle’s research also seems to indicate that India’s talent pool is much younger than elsewhere and seems more bottom heavy, with fewer Master’s and Ph.D-level talent. In order to remain competitive in the job market, many Indian graduates and professionals are opting for on-job training and MOOCs & online courses. Simultaneously, many candidates are also opting for higher studies in data science, machine learning, and big data analytics. As I stated in the beginning – too many options also lead to confusions. Now, it’s time to throw some light onto this. Data science is a study of the extraction of data. Data science works fundamentally through the formulation of hypotheses Example, Guessing a solution of the data and analyzing it and then finding a reasonable solution through observations and concluding whether the hypothesis is right or falsify it. Data science is an umbrella of all the techniques and methods which are used to analyze the massive data sets. Various scientific methods are used and are combined with algorithms to extract similar data all around and then it is converted into simpler data for the sake of analysis and better understanding. In simple terms, Machine learning is a subset of artificial intelligence in the field of computer science that often uses statistical techniques to give computers the ability to “learn” with data, without being explicitly programmed. The machine learning concept was designed to allow the computers to learn automatically and adjust themselves according to the need. 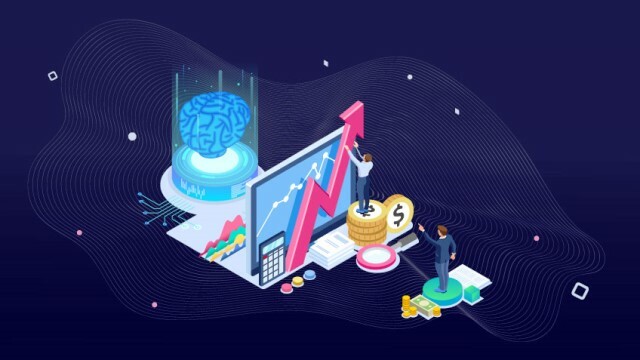 It is the fastest and most flexible predictive model in the world which is used massively for predicting the availability of the supply and demand in the world. Machine learning can be defined as the practice of using algorithms to use data, learn from it and then forecast future trends for that topic. To make things simpler, you can consider machine learning as a part of the broad field of data science, at least when it comes to choosing between MS Data Science and MS Machine Learning. Data science uses ML to analyze the data and make possible predictions about the near future. It also combines with other disciplines like big data analytics and cloud computing to give the best and appropriate results. Machine learning uses various techniques like regression and supervised clustering. On the other hand, ‘data’ in data science may or may not evolve from a machine or a mechanical process. So, the main difference between data science and machine learning is that data science as a broader term not only focusses on algorithms and statistics but also takes care of the entire data processing methodology. Data Science creates insights from data dealing with all real-world complexities. ML can accurately classify and predict the outcome for datasets by observing the historical data. The output and input of the data can be easily understandable by the human. Input data of ML is present in specific algorithms which cannot be understandable by the human. Data science is capable of handling both structured and unstructured raw data ML includes more algorithms and mathematical concepts. Performance measures are not standardized. It changes from case to case. It is an indication Data Timeliness, Data Quality, Querying Capability, Concurrency limits in data access, Interactive visualization capability etc. Performance measures are standardized Many algorithms are used and each algorithm will have a measure to understand the data model. SQL and SQL like syntax languages (HiveQL, SparkSQL etc) are the most used language in Data Science Python and R are the most used languages in Machine Learning. In Data Science represents visualization of data is easy and directly using any popular graphs like bar, pie etc. In ML, mathematical models are used to represent the data. As mentioned earlier, data science is the umbrella term and is a multidisciplinary field focused on finding actionable insights from large sets of raw and structured data. Data analytics is a more focused version of this and can even be considered part of the larger process. Analytics is devoted to realizing actionable insights that can be applied immediately based on existing queries. Another significant difference between data science and data analytics is a question of exploration. Data science isn’t concerned with answering specific queries, instead of parsing through massive data sets in sometimes unstructured ways to expose insights. Data analysis works better when it is focused, having questions in mind that need answers based on existing data. Data science produces broader insights that concentrate on which questions should be asked, while big data analytics emphasizes discovering answers to questions being asked. Read more about the differences between a data scientist and a data analyst. 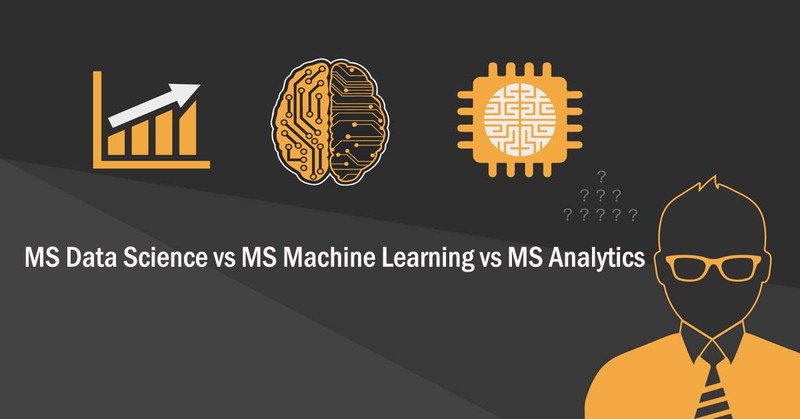 MS Data Science vs MS Analytics – How to Choose the Right Program? 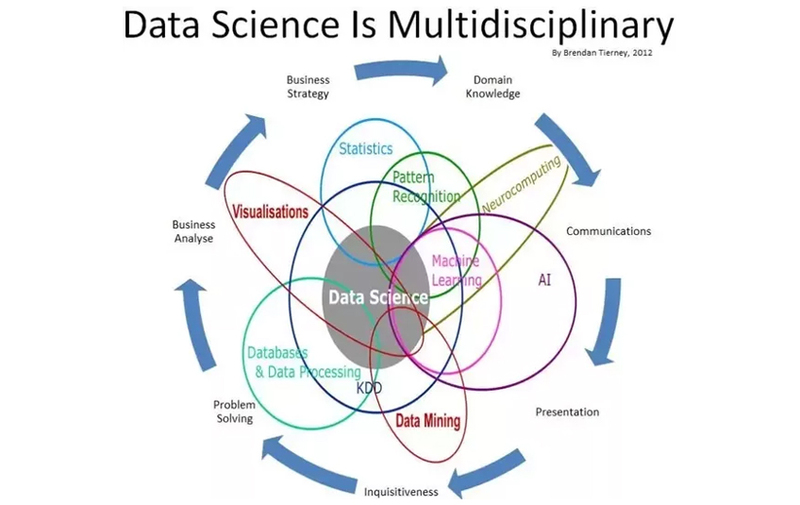 Data Science and Data Analytics are extremely overlapping and inter-related. The techniques and tools are also quite similar. You can use both R and Python in data science and analytics. The major difference is around the applications. For example, R is more suitable for Analytics (deriving insights from data and/or data visualization) whereas Python is more suitable for Data Science (predicting the unknown). You can become a Data Scientist by pursuing MS Analytics. Similarly, you can become an Analyst after studying MS Data Science. Within the broad field of analytics, there are two segments: data analytics and business analytics. So, what are the differences between data analytics and business analytics? Data science could be considered as the incorporation of multiple parental disciplines, including data analytics, software engineering, data engineering, machine learning, predictive analytics, business analytics, and more. It includes retrieval, collection, ingestion, and transformation of large amounts of data, collectively known as Big Data. Data science is responsible for bringing structure to big data, searching for compelling patterns, and finally advising decision makers to bring in the changes effectively to suit the business needs. Data analytics and machine learning are two of the many tools and processes that data science uses. MS Data Science, MS Data Analytics, and MS Machine Learning are some of the most in-demand study abroad programs right now. The right program along with the combination of the right skill sets and real-world experience can help you can secure a strong career in these trending domains. There is not a clear-cut answer to MS Data Science vs MS Machine Learning and AI vs MS Analytics. It completely depends on your profile, existing skills set, and career goals. Here are few tips to minimize the confusions. The majority of MS Data Science (and MS Machine Learning programs) require solid knowledge of programming, linear algebra, statistics. In contrast, MS Analytics programs do not always ask for prior programming experience. So, check how much you know and see where you can apply. Secondly, explore and introspect what do you want to learn. This is very important. Even a Data Science program at ABC University can be pretty different in terms of content from a Data Science program at XYZ University. Similarly, you can also become a data scientist by pursuing MS Analytics. So, more than the program name, you need to do thorough research on the program content. 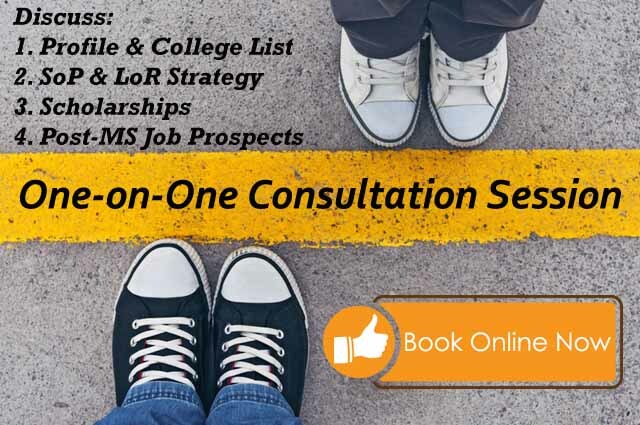 Want to have a one-on-one consultation? Sign up now! It’s always better to start with a broad field and then figure out the specialization. 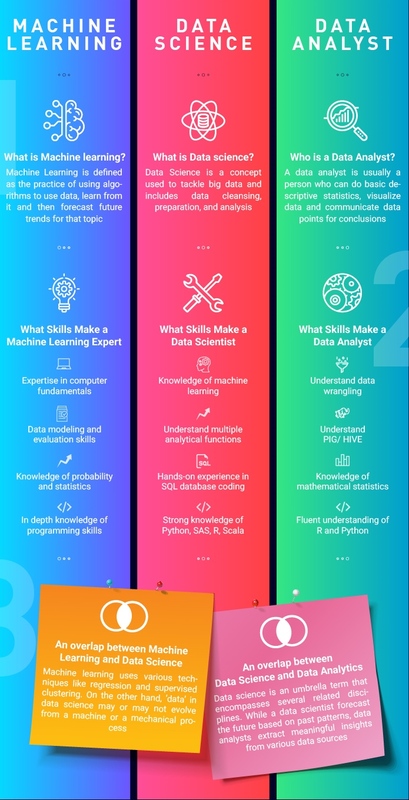 For freshers (no professional work experience), I would always recommend MS Computer Science with specialization in Data Science or Machine Learning/AI. If you have got 2 – 5 years of work experience and you know R/Python, a few other programming languages(s), and big data tools along with solid knowledge of statistics and mathematics, MS Data Science is a great option. Masters in Data Science is a combined degree in computer science, statistics, and business. 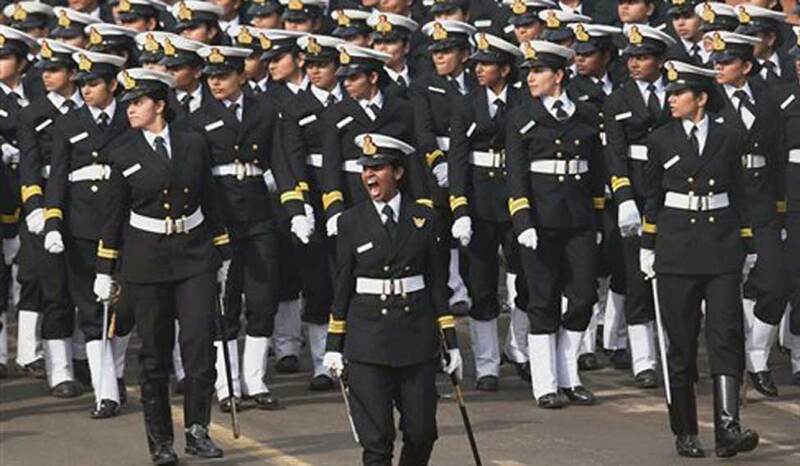 The master graduates from this background are given a lot of importance while taking a decision in the organization. 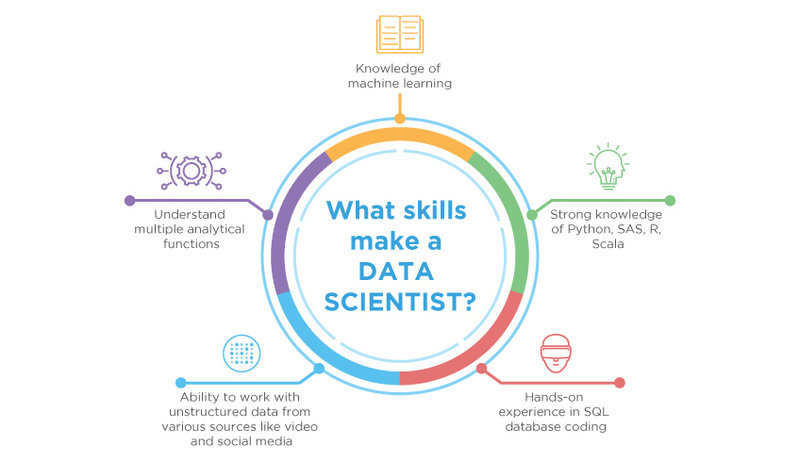 If you have pro knowledge in Data Visualising techniques and can extract lots of unstructured data into simplified data then masters in data science can take you a long way in your career path. If you possess little knowledge of programming (R, Python, Scala, Java, PHP etc. ), but a fan of stats and maths, you could opt for MS Analytics (MS Data Analytics). If you don’t have prior experience in programming/coding, MS Business Analytics could be a better option. Alternatively, if you have more than 5 years of professional work experience or you want to be on the product management side, you could also consider MBA with specialization in Analytics. Only if you have been working on R, Python, and other big data tools for more than 5 years in the product division, then you could think of MS Machine Learning if you want to stay in the technical domain. For pursuing Masters in Machine Learning, you must have strong technical skills and you should be familiar with implementing them with perfection then Masters in Machine learning will be the best option for you. This course requires the creation of new algorithms and expert knowledge of mathematics and statistics. If you can with maths and write machine learning models then Masters in Machine learning is for you and you can make a bright career. Earning an MS in Data Analytics is a good option for professionals with a STEM background who are interested in learning how to gather, organize and analyze data in or outside of a business context. 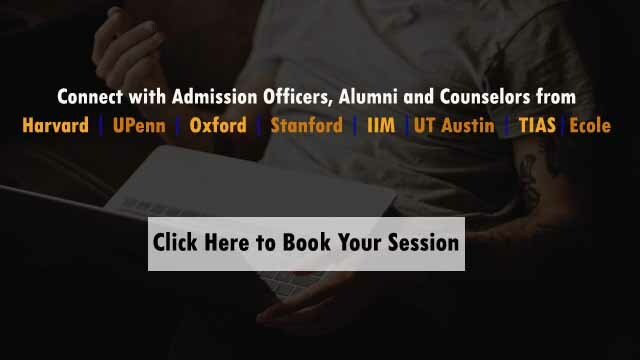 Courses included in a master’s in data analytics program will give students hands-on experience with analysis techniques such as multiple regression and logistic regression, teaching them how to find critical patterns within datasets. An MS in Business Analytics typically offers courses that provide a comprehensive set of both technical and business skills, including management and communications. Business analytics professionals use analytical tools for improved business decision making. Their starting point is a specific business application, for which they identify which data and methodologies are best suited to approach the problem at hand. Like their counterparts in a data analytics graduate program, business analytics students will learn how to discover data trends. However, business analytics students not only learn the tools and techniques for analyzing both small and large data sets, but they also do so within specific business domains and recognize which analytical tool is most effective for solving a given business problem. Business analytics graduates are responsible for identifying areas where their organizations can be improved, discovering insights from data, and proposing plans for improved decision making. Their findings may lead to operational efficiencies, product innovation or discoveries about customers. Both Data Science and machine learning are very inter-related. It’s hard to distinguish them at least at the Masters level. So, don’t bother to differentiate them. 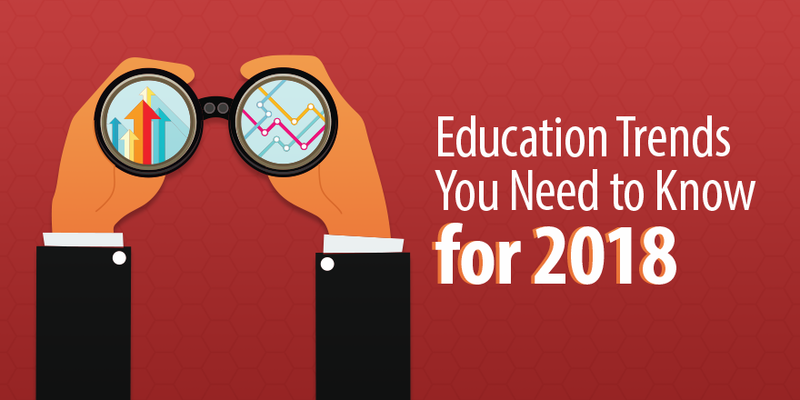 Between data science and data analytics, it all depends on your existing skills and learning objectives. The course pattern, structure, syllabus everything is quite similar and are interrelated. But regardless of what program you choose to make sure that you undertake many projects and internships. This can provide you with real-time experience in the industry and can fetch in the topmost company. More than the name of the degree itself, what matters to employers is that you have real experience working with messy data, applying models, and understanding the business context. Under no circumstances, coursework can compare to an internship or even a side project or Kaggle competition to help employers see evidence of your understanding of real data science.